Street: Where do you spend most of your time on campus besides home? Will Davis: Occupying the thoughts of Penn’s lovely co–eds. Street: We have to ask… what’s up with the leotard? WD: It came at the suggestion of a friend, Pat. Whenever he’s pitching poorly, he wears a thong to take his mind off of how he’s throwing. I wasn’t playing well, and the leotard was sitting in my drawer, so I figured what the hell; look good, play good. Street: My PennCard photo looks like I’m… WD: A blonde, douchey idiot who is thrilled to have never met a comb. Street: What don’t most people know about you? WD: I’m very single and very disease–free. Street: Worst part about being an athlete? WD: Sorry, I can’t hear you… my biceps are in the way. 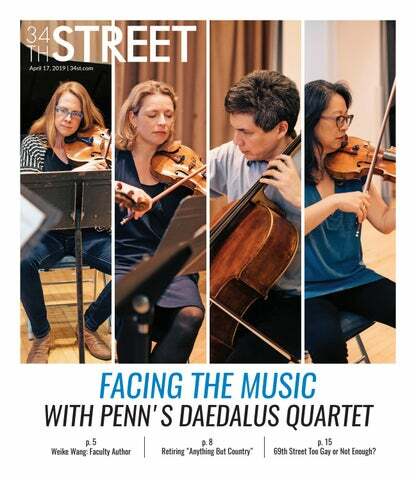 Street: Best thing about sports at Penn? WD: Team Showers. There’s always that one spot I can’t reach, but that’s what teammates are for. Street: What’s your favorite Disney Channel Original Movie? WD: The Color of Friendship… sike. Brink! I roll with Team Pup N’ Suds. Street: There are two types of people at Penn… WD: Those that can find Meiklejohn Stadium and those that cannot. Street: If you were on a reality TV show, which one would it be? WD: Nothing spells class like The Real Housewives of Atlanta. Street: You’re this week’s ego, but who’s your alter-ego? WD: Dill Wavis, he’s a lush. Street: How many baseball players does it take to screw in a light–bulb? WD: Ask the women’s soccer team. Street: What will you miss most about Penn? WD: CollegeACB. Street: Are you a dog person or a cat person? WD: I am the cat’s meow. Street: What’s the first thought you have when you wake up in the morning? WD: Why am I so stiff? Street: If you were a Spice Girl, which one would you be? WD: Old Spice. See previous question. Street: If you taught a class at Penn it would be… WD: Poorly attended.